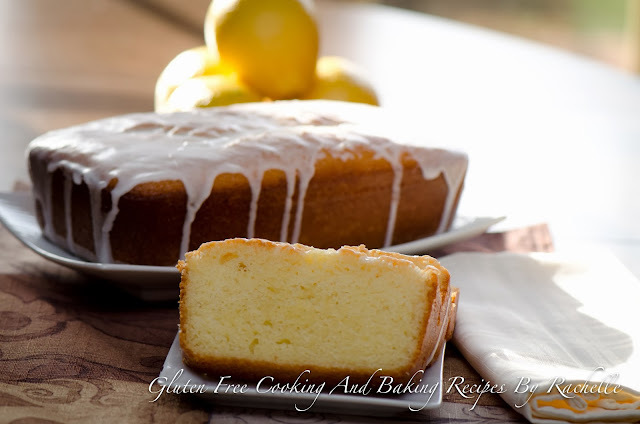 I love lemon loaf, well let me rephrase that I LOVE anything that has to do with lemon. I was really bummed out when I was diagnosed with Celaic's that I had to give up my lemon loaf addiction from Starbucks. However after I whined and complained that I could no longer have it I thought I would develop a recipe that I could eat and enjoy just as much. I haven't found a gluten-free dairy-free recipe out there, so I developed my own and I hope you all like it as much as we do. I love the lemony light flavor of this loaf and if you really like lemons as much as I do you could also add the zest to this recipe as well and make it even more lemony. YUM!! In a stand mixer add sugar, eggs, and butter, beat for about 2 minutes on medium speed or until mixture becomes pale yellow. Turn mixer down and add oil, lemon juice, vanilla extract, lemon extract, mix until combined. Slowly add sea salt, baking powder, baking soda, and gluten-free flour 1 cup at a time until thouroghly combined. Scrape the sides of your bowl and mix until combined. Pour mixture evenly into your two loaf pans. Bake for 45 minutes or until a toothpick is inserted comes out clean. Let cool completely and drizzle with lemon frosting. Oooh! I'm a sucker for anything with lemon! This looks divine!!! Thank you so much Jules!! This looks delicious! Do you think it would work with an egg replacer? I tell you quietly that is good, fragrant as a common bread ..
Is there a way to print the recipes? I can't find the button on this one. Thanks!